I noticed some patches of a small, bright-green plant fully submerged in the slack waters beside the River Ehen a kilometre or so below the outflow from Ennerdale Water. My first look suggested a tangle of narrow, flaccid grass-like stems but a closer examination showed that each of the narrow stems had whorls of branches arising from them at intervals (similar to the pattern seen in horsetails). Their size and structure suggested an affinity to the vascular plants such as Myriophyllum and Juncus that I also saw in the river that day but, actually, these plants belong to an algal genus called Nitella. I could not see any reproductive organs on these plants, but other evidence points to them being Nitella flexilis. 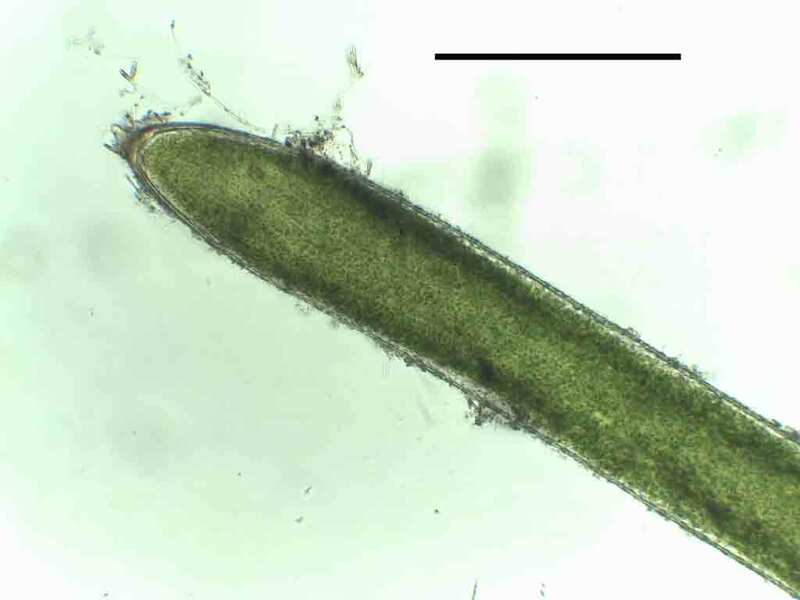 Nitella belongs to a group of algae called the Charophytes which have been the subject of vigorous debate by phycologists and evoloutionary scientists for a long time. The author of one recent paper went so far as to claim that “no group in the plant kingdom has presented greater difficulties in classification …”. They are usually placed in the green algae (Chlorophyta) although some people regard them as a separate division entirely. Charophytes, in fact, have several characteristics, as well as their size and pigmentation, that suggest that they may be the closest algal relatives of land plants. These similarities extend to the reproductive organs (see Chris Carter’s image of Chara virgata in a post from July last year). Nitella flexilis photographed in the River Ehen, 18 March 2014. Scale bar: 1 centimetre. Under the microscope, some oddities of Nitella and other charophytes become clear. The branchlets , despite their size, are composed of single giant cells, each with many tiny chloroplasts around the margins and a large central vacuole. If you watch closely, you can see the cytoplasm close to the vacuole within these cells streaming around (though this proved to be hard to capture on video). These giant cells made the charophytes very popular with physiologists, as they were easy to manipulate in the laboratory. A cell of a branchlet of Nitella flexilis from the River Ehen collected on 18 March 2014. Scale bar: 1/10th of a millimetre. 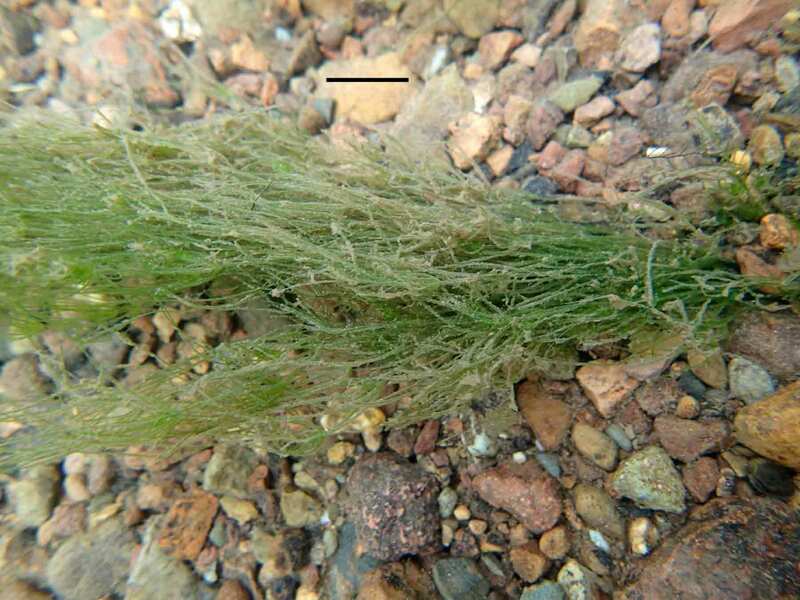 Their large size and distinctive appearance has meant that Charophytes were often recorded by mainstream botanists who usually ignore algae completely. This means that we have a better understanding of their distribution than is the case for most freshwater algae. These show records of Nitella flexilis and relatives to be particularly clustered around the Lake District and other areas associated with soft water, though more often in ponds and lakes than in rivers. It is certainly not a common genus so this is one more feature that makes the River Ehen such a fascinating river to study. Bennici, A. (2008). Origin and early evolution of land plants. Problems and considerations. Communicative and Integrative Biology 1: 212-218. Karol, K.G., McCourt, R.M., Cimino, M.T. & Delwiche, C.E. (2001). The closest living relatives of land plants. Science (New York) 294: 2351-2353. Ruhfel, B.R., Gitzendanner, M.A., Soltis, P.S., Soltis, D.E. & Burleigh, J.G. (2014). From algae to angiosperms – inferring the phylogeny of green plants (Viridiplantae) from 360 plastid genomes. BMC Evolutionary Biology 14: 23. All this talk of algae life-cycles alternating between diploid and haploid stages takes me back to winter afternoons in undergraduate botany practical classes when the basics of plant life cycles were driven into us. Roughly speaking, the principles of biology can be split into those that are common sense and those that need to be explained over and over again to overcome our natural preconceptions. “Common sense”, in this instance, means that the principle in question roughly aligns to our own anthropogenic outlook. And one thing that humans – along with all other animals – don’t have is alternating generations. A step backwards: “diploid” means a cell with a full complement of chromosomes and “haploid” is a cell with half a set of chromosomes (see note). In the human, the “haploid” phase is the short period of the life cycle between production of sperm and egg cells (collectively termed “gametes”) and the successful fertilisation of an egg by a sperm cell. So the human life-cycle consists solely of the alteration between a multicellular diploid phase (that’s you) and a unicellular haploid phase. In the case of all but the very simplest algae, there is a multicellular haploid phase (the “gametophyte”) which produces the gametes. These then fuse to produce a multicellular diploid phase (the “sporophyte”), some cells of which undergo meiosis to produce haploid spores. These spores germinate to form the next generation of gametophytes. Got that? Probably not. It is not an easy concept to grasp partly because it does not accord with the human experience. Moreover, in flowering plants, the sporophyte is dominant and the gametophyte stages are reduced to “parts” of the flower (the entire male gametophyte, for example, is contained within the pollen grain). It does not help the cause that the most conspicuous group of plants have their alternation of generations largely hidden from view. When I was an undergraduate, knowing about alternation of generations was regarded as necessary if we were to understand the evolution of plants. Unfortunately, the experience of having plant life cycles drilled into them probably turned many undergraduates off botany forever. I am fairly sure that few UK university departments teach these principles in anything like the detail that my generation had to endure. Alternation of generations isn’t something that the average biologist needs to know in great detail and, to be honest, I forgot a lot of the details. I had to refresh myself when I taught courses on algae and the lower plants to undergraduates in Nigeria and, once again, when I started boning up for the post about Audouinella. As Bill Farnham pointed out, I may not have got all the details right. No excuses for my own failings but this is yet another manifestation of a problem that I have mentioned before: that science has a “trailing edge” of knowledge as well as a “leading edge” (see “An inordinate fondness for … algae”). There is an enormous amount of information on algal life cycles in the literature but it is not always easy to find, especially when accessing the literature via internet search engines. We might not need the information very often but it is as easy to lose familiarity with the terminology as it is for an athlete to fall out of condition through lack of exercise. Note: another way of looking at it is to say that the haploid phase has a full set of chromosomes whilst the diploid phase has two full sets. I was being deliberately anthropocentric in describing the haploid phase in this way. And, if we are going to be pedantic, every “multicellular diploid phase” necessarily starts out, albeit briefly, as a single celled diploid phase.